As this site is still recovering from being hacked and subsequently taken down, please bear with me as I get all the contributors' details back up here. Nyree Bekarian holds a Master’s Degree in Public Health from the University of California, Berkeley, and has a background in cellular biology and immunology. Nyree’s focus is on bridging the gap between scientific data and consumer understanding. She was drawn to this area after asking questions about products she used daily. As a mother, she feels that it is even more crucial to try and understand all the chemicals she brings into her home in the form of food, personal care items, and other products. She believes that there is important information about toxins present in everyday items that is either too technical for consumers to understand or is not provided properly to consumers. She also believes that all consumers have the right to understand what is in the products they use, so that they can make informed decisions on what to buy, both for themselves and their families. Nyree is currently employed as an environmental consultant, specializing in assessing human exposures to chemicals in consumer products. She is also a contributing writer to Greenopedia.com, a website dedicated to researching and reporting on topics in environmental sustainability. Nyree lives in Oakland, California with her husband and two small children. You can also find her on twitter. Nicole Bijlsma is a woman of passion, and her passion lies in environmental medicine. She first became interested in building biology as a result of two events that occurred in her life: the first was when she began to notice the connection between many of her patients’ ill health and their homes. The second was her infertility problem. The cause of her ten miscarriages was eventually identified as an immune disorder (which was diagnosed by a US reproductive immunologist) which she now suspects arose from long term exposure to a high electromagnetic field. Once these issues were addressed, she successfully gave birth to her children. Nicole is an accomplished naturopath, acupuncturist and building biologist who has been in clinical practice since 1989. She is the founder of the Australian College of Environmental Studies which was established in 1999 to educate people about the health hazards in the built environment. The college provides nationally accredited training in Building Biology. Nicole is the author of the best seller Healthy Home, Healthy Family. She has been featured on every major Australian television network and conducted dozens of radio interviews. Nicole lectures and writes widely about the built environment and the way in which it influences our health. You can connect with Nicole at http://www.buildingbiology.com.au/ or on Facebook. Joanna Cozens is one half of the duo behind www.dailyorganic.com.au. Up until a couple of years ago, she and her husband Dave were like many Australians and took the worn path to the supermarket, stuffed their trolley full of stuff apparently called food, slathered themselves in lotions bursting with chemicals, and ‘cleaned’ house with products that would best be classified as weapons of mass destruction. On top of all that, they were ready for a professional change too. After 30 years combined experience playing in the advertising and marketing space (and subsequently feeling a little bit older and wiser) they wanted to start using their skills “for good rather than evil”. “The light bulb moment was when we asked ourselves how we could combine our passion for living more organically, sustainably and ethically with our existing skills to have the best of both worlds i.e. do something we love and finally use what we know to really make a difference,” Joanna explains. Connect with Joanna at www.dailyorganic.com.au or on Facebook. Sonia Donaldson is a passionate mum on a mission. She wants to change the world, one family at a time. ‘Healthy, Happy and Holistic’ is her catchphrase and goal in life. Sonia is the creator and writer at Natural New Age Mum, a popular blog sharing ideas on healthy, whole food, chemical free living and inspiration for the soul. By encouraging readers to make small changes in an easy to read and non-judgmental way, Sonia has built up a huge following in just under two years. She has a business degree and a background in management and the wellness industry. After contracting an auto-immune disease eight years ago, she was forced her to examine her life in more detail and start exploring and adopting a completely natural, new age way of living. It has been incredibly life changing for her whole family. Sonia lives in sunny Queensland with her new age hippy husband, two teenagers and a dastardly dachshund called Wilbur. You can find her on the yoga mat, walking on the beach, sipping a chai tea on her back deck or scrounging in the op shops for bargains. Connect with Sonia at http://www.naturalnewagemum.com, or on Facebook. Katy Farber is the author of Eat Non-Toxic: a manual for busy parents and blogs at Non-Toxic Kids, which she started in 2007 after the birth of her second daughter. She was constantly reading about environmental health, green living, and parenting issues, and wanted to share what she learned with other overwhelmed, sleep deprived parents. Since then, Non-Toxic Kids has grown into a popular green parenting and environmental health blog. Katy and the site have been featured in The Washington Post, the Richmond Times Dispatch, the Toronto Star, Enviroblog, Terrain Magazine, the Huffington. She has a growing following on both Twitter and Facebook and regularly interacts with readers online. In addition, Katy writes for Moms Clean Air Force, MomsRising, Safer Chemicals, and has published articles on CNN’s School of Thought blog, Fox News Opinion, Problogger, Educational Leadership, and many others. She is also the author of two books about education, Why Great Teachers Quit and How We Might Stop the Exodus (2010), Change the World with Service Learning: How to Organize, Lead and Assess Service Learning Projects, (2011). Melissa Goodwin is the creator of the Australian website, Frugal and Thriving and author of the eBook, Plan Cook Save. “Frugal living started out as a necessity when I left home. As a student earning a casual income, I had to be creative with my finances. Nowadays, frugal living allows me to be a stay-at-home mum to my two young children,” says Melissa. “But frugal living is more than just saving money. I’ve always been a greenie at heart, but the more I read about environmental issues, the more I realised that frugal living goes hand in hand with healthy and sustainable living. “Making your own cleaners for instance, not only saves you money, it reduced the toxic chemicals you are exposed to. Cooking whole foods from scratch rather than eating manufactured food makes us healthier. So too does a walk in the park rather than sitting in front of the television. And of course, our natural environment benefits from us consuming less too. A frugal life leads to a thriving life for all. Find with Melissa on Frugal and Thriving or on Facebook. Kate Hennessy is a Sydney-based journalist specialising in music, travel, arts and health and wellbeing. She has written for many major papers and publishers, including ABC online, The Sydney Morning Herald, The Age, the Guardian UK, the Guardian Australia, The Daily Telegraph and the Australian Financial Review as well as magazines such as WellBeing, Get Lost Adventure Travel, Family Health and Green Lifestyle. Kate is a weekly music critic for The Sydney Morning Herald, teaches writing at The Australian Writers’ Centre, is editing an illustrated children’s book and regularly pens scripts for the Channel 7 kids’ game show, It’s Academic. She has particularly enjoyed some fascinating commissions from WellBeing Magazine over the years on topics including the symbolism of water across cultures and times, her hunt for an authentic whirling dervish performance in Turkey, the benefits of families taking ‘digital detoxes’, an investigation into yoga for men and profiles of inspiring people like slow food chef Sherry Strong and astronomical artist Jon Lomberg. Her best two commissions yet have been her journey into Peru’s Sacred Valley to undertake a shamanic healing using the hallucinogenic healing medicine, Ayahuasca, for Wellbeing Magazine, and a trip to the aboriginal community of Barunga in the top end for Australia’s largest remote community festival, which she wrote about for a Guardian UK cover feature. Her article on nanoparticles in sunscreen, included in Less Toxic Living, saw a strong reaction among her social networks, some of whom suggested it would cause greater harm than good to raise any doubt at all about sunscreen and drew parallels with the fraught immunisation debate. However, Kate believes the best way to resolve the issue, for both sides, is proper safety testing and labelling and that history has taught us that informed choices are always a good thing. Connect with Kate at www.katehennessy.com.au or @smallestroom. Jo Hegerty has been a magazine editor, travel writer and brand manager. These days, you’re likely to find her mucking out the chicken coop, baking bread or overspending at her local tip’s treasure market. In addition to writing for wonderful magazines like Green Lifestyle and Wellbeing, Jo manages Down To Earth Mother, a popular blog providing green living tips to busy mums. Jo is deeply passionate about living a sustainable life and leaving a better world for our children and their children. Down to Earth Mother was designed to inspire and inform the world’s true change makers – parents – in a non-preachy, fun way. To find out more, visit www.downtoearthmother.com or find Down to Earth Mother on Facebook. Jo lives in deepest, darkest suburbia just outside Brisbane with her husband and two kids, a lively cattle dog, four chickens and that creature living next to the compost. When she’s not blogging, writing for real money or enjoying her family, Jo writes YA novels. See www.johegerty.com. Through her work in threatened species conservation, Tricia has seen first-hand the destructive impact our consumer culture has on the environment. She’s passionate about living a life that is less about consumption and more about meaning, connection and happiness. Tricia hopes to inspire other families to reduce their environmental impact through her weekly Newcastle Herald column ‘Less is More’ and her blog littleecofootprints.com. For inspiration of how to live better with less visit littleecofootprints.com or follow Tricia on Instagram. From doing energy work with Tibetan nuns in India, to volunteering for sustainable agriculture in the Philippines, to interning at a water fasting retreat center, Dr. Teray Garchitorena Kunishi has spent most of her life exploring what it means to be truly happy and well. Her first introduction to natural medicine was through her work with the Jesuit Volunteers of the Philippines, where she was assigned to support farmers in developing cooperatives, and using organic methods for growing food. After stumbling upon a book about the impact of sugar on health, she decided to make some simple but profound changes to her diet. Soon after, she began her medical training at Bastyr University, one of the world’s most respected schools for naturopathic medicine. Dr. Teray is co-founder of the Berkeley Naturopathic Medical Group in Berkeley, California. Her clinical focus is on integrative treatments for mental health conditions. Her workshops and programs provide solutions for depression, anxiety, fatigue, chronic stress, and insomnia, ADHD and PTSD, using nutrition, herbal medicine, coaching and mind-body medicine. She lives in Oakland, California and also leads workshops, keynotes and talks throughout the San Francisco Bay Area. Find Teray at www.berkeleynaturopathic.com or on Facebook. 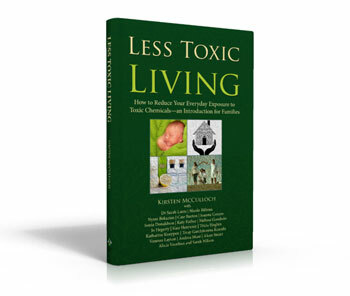 It wasn't until sometime after her third child was born, that Kirsten McCulloch started work on what would eventually become Less Toxic Living, but it was the process of trying to get pregnant that fully started her on her journey to cutting as many toxins out of her everyday life as she could. In truth, Kirsten's interest in reducing our exposure to toxic chemicals dates back to her time writing for the "Green Youth Group" newsletter as an eighteen year old, volunteering for The Wilderness Society. But that interest was later revitalized when she was trying to get pregnant. Having been told in her early twenties that she might have “a few” miscarriages before her uterus learned to grow as it should, she decided to do everything she could do prepare her body to carry a baby successfully. More recently, learning in the space of 12 months that her cousin, then her sister and finally her step-father all had cancer, suddenly the “she’ll be right mate” approach we often take to unknown risks, stopped sitting so well with her. It’s all very well to say “in my day we ate lead-painted toadstools and drove trucks with our babies hanging out the window, and they’re all right.” But what about the people who aren’t all right? What about the ones who developed cancer down the track, or who have asthma or other serious allergies or learning disorders or hormonal imbalances? What about the ones who died? And the ones who will die, ten years hence, with no clear explanation for their condition? The more research she did, the more Kirsten realised that we are constantly exposed to a cocktail of toxic chemicals, and almost no-one realises it. Individually, many of the toxins might be safe in small doses. Unfortunately, when they mix together in our bodies the doses are no-longer so small, and the research into their effects is no longer so clear. Or in some cases it is all too clear, and we need to do something about it. Kirsten is an Australian writer and mother, passionate about living a more sustainable and healthy life—for herself, her family and the planet. She writes about sustainable living, non-toxic cleaning, health, and parenting. She has a Master’s Degree in Writing and Literature, and a long history of working with environmental and natural health organisations, from her time volunteering for The Wilderness Society to working as a qualified massage therapist and teacher. After becoming a mother, it was a natural step to start considering how our consumer practices and environmental toxins are affecting not only the environment, but our children as well. She has written for various online and offline publications such as MindBodyGreen.com, The Shake, Artlook, and In Good Hands. Connect with her at SustainableSuburbia.net or on twitter @sustainsuburb. Andrea Muse is a Registered Nurse turned Frugally Sustainable Homemaker. She writes at Frugally Sustainable, which she describes as the story of her family’s ‘transition out of a consumer culture into the brave world of sustainability’. You can download her free ebook Herbal Rescue: Your Guide to Creating a Homemade Herbal First Aid Kit, from her website. Find Andrea at http://frugallysustainable.com or on Facebook. From luxury cosmetics to being a folk singer songwriter, famed cocktail bartender, training, consulting and running a boutique events business: you’d think that would be enough for some in the first 20 years of career. Well, there was still something missing for Alexx Stuart. She explains it as wanting unanswered questions answered, on behalf of many – a niggling curiosity that she couldn’t shake when it came to the crazy health situation in the modern world. Having healed herself through natural therapies and much research, clawing back from a time of chronic migraine, countless rounds of antibiotics for chronic tonsillitis, PCOS and thyroid issues, she has a strong opinion on why she and so many have found ourselves in the degenerative mess we find ourselves in, and shares collective wisdom on how to get people out! Alexx is on a mission to help people eat better and be more conscious of what we use on our skin and in our homes, while eradicating all those guilty moments and feelings of deprivation from our psyche. She believes true change and guilt cannot co-exist and in her demos, keynotes and writing, the message is always one of empowerment, justice and big picture progress. Her first book Real Treats shot to #1 Amazon best seller within 12 hours of publishing. Alexx has made the first chapter of Real Treats, along with a bonus recipe, available to Less Toxic Living readers as a free bonus. Neither nutritionist nor doctor, Alexx calls herself a ‘concerned citizen’ who feels called to a task to help, in a world gone a little bonkers. Alicia’s journey toward safer living started in 2006 when Joanie, one of the Land sisters, moved to South Carolina with her husband and baby boy. She called home one morning after taking her son to their new pediatrician where she was advised to immediately throw out all clear, hard plastic baby bottles to protect her son from endocrine disruption. She left the appointment in shock and began to worry that she was dealing with a doctor who was off his rocker! So she turned to her sister Alicia, a Registered Nurse and unapologetic medical research geek, for help. Alicia set out that day to prove him wrong but hundreds of research studies only proved him right. The more information she pored over, the more she began to see a pattern of chemicals leaching from plastic, skincare, and cleaning products to cause damage – especially in children. Alicia began a search for a plastic baby bottle made without bisphenol-A to recommend to Joanie. She was was shocked to only come up with only one possibility after weeks of phone calls to manufacturers. Her continued search for safe products eventually lead to the birth of The Soft Landing, LLC in 2007. Alicia now works with her mom and sisters to educate parents about the dangers of toxic chemicals in everyday products and their effect on growing children. The Soft Landing team specializes in childproofing and healthy home consultation for families who are interested in protecting their loved ones ones from physical harm and from toxic chemical exposure. Their work has been cited by ABC News, Newsweek, New York Times, USA Today, Fox 4 News, KMBC 9 News, The Kansas City Star, National Geographic’s The Green Guide, Dr. Greene, Kiwi and the Environmental Working Group (EWG). Connect with Alicia at http://thesoftlanding.com or on Facebook: https://www.facebook.com/thesoftlanding or Twitter: https://twitter.com/thesoftlanding.